Valentina Seferinova - "Quotable Quotes ..."
".... you are a great artiste and a great pianist, and you understand Schubert .........there are probably 3 pianists on the face of the earth who can do this (Schubert's "Sonata in B flat major") - you're one of them. ..... a great artiste and a great musician (putting herself) at the service of the music - 100%. ...this was a great encounter - because you're a tremendous musician; and a great spirit; I mean huge, - and you have everything. Thank you for being available"
"....Ms Seferinova has a grand technique and plays brilliantly." "Valentina Seferinova takes on a difficult task, ...... She is a fluent pianist, and does a fine job..."
“Stunning accuracy marks piano recital from Miss Seferinova ...."
".....I understand that Miss Seferinova was one of the leading pianists in her native Bulgaria ......... She has an impressively fluent technique. Their loss is our gain." "....gave a stunning all-Raff recital...."
"...- stunning accuracy, a real feel for the architecture of each piece and an understanding of the contrasting elements of Raff's style, integrating the warmly lyrical with the contrapuntal and fugal. ..... an emotional intensity expressed by ....... She seems a pianist of rare talents - whilst the delicacy might be expected from her small frame, the sheer power is more of a surprise. .......her total dedication to what she was playing. .... .On this showing she is a fine artist indeed and richly deserves success in the wider repertoire on the national and international stage." "The capacity audience at Chichester Cathedral for Valentina Seferinova's piano recital was held spellbound by (her) virtuosic range .... Swiss-born romantic composer Joachim Raff sounding like Liszt, and like Liszt demanding the finest technique. This technique Valentina has, ... "
"….. In Jadassohn’s Piano Concerto we are treated to a stormy attack. Heroic shrapnel flies every which way in repeated evocations of the Liszt and Schumann piano concertos. Valentina Seferinova is fully in charge and attacks the solo part with great romantic flourish. Her stonily commanding tone is unmistakable. ….."
"Sadly, there's not a word about the very fine pianist in the CD booklet. Valentina Seferinova is playing all this difficult piano music." "On this disc we hear Bulgarian pianist Valentina Seferinova playing two sonatas together with the Three Morceaux, Opus 2. ....... 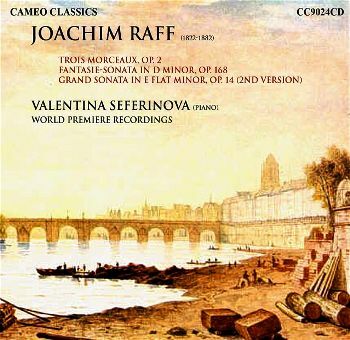 Performance of these works is confidently undertaken by our soloist in recordings apparently dating from 2002 and go far to underline the importance of Raff's contribution ....."
"Charming pieces all beautifully played by Valentina Seferinova with excellent piano sound. Highly recommended." "Valentina Seferinova is unknown to me but on this CD she is a consummate artiste of considerable talent."